The Dallas Safari Club has auctioned off a hunting permit for a Namibian black rhino. The winner of that auction needs to obtain an import permit from the U.S. Fish and Wildlife Service to bring the rhino they kill back to the U.S.
Urge the U.S. Fish and Wildlife Service to deny the application for the import permit. With fewer than 5,000 left in the wild, black rhinos need your help. I urge you not to issue the import permit that would allow the winner of the Dallas Safari Club auction to import a black rhinoceros trophy from Namibia. This would continue a terrible precedent for this and other critically endangered species whose future depends on keeping healthy populations in the wild. Killing in the name of conservation is unacceptable. Instead, promoting the killing would undermine conservation efforts that are so desperately needed to save the dwindling numbers of black rhinoceroses. 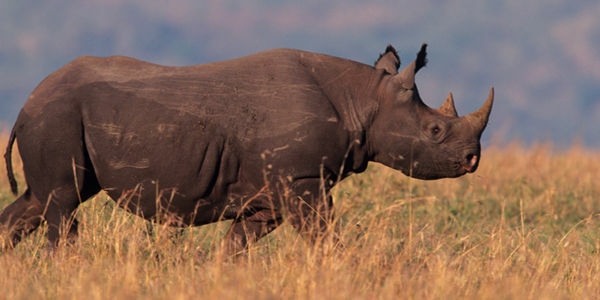 With fewer than 5,000 remaining in the wild, the black rhinoceros is on the brink of extinction. The U.S. Fish and Wildlife Service has an opportunity to set an example for the world by denying the import permit for a rare black rhino that would be needlessly killed for no reason other than to decorate a hunter's trophy room.